Thank you ! I was crushed when Allison texted Tobin's reaction. Reading this...I am positive you made the right choice in letting him experience this game. Thankful that he had Allison's arms to fall in and experience his pain. I am sure he is also proud of the way UNC handled this loss. 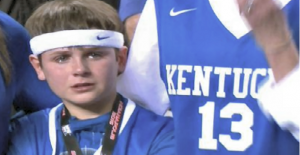 Let him know my favorite UNC player...Michael Jordan cried too. Love to all!